NETWORK FINALS: THE GOLDBERGS, SURVIVOR and EMPIRE gained 0.1 in final numbers, but both HARRY POTTER: A HISTORY OF MAGIC and the rerun MASTERS OF ILLUSION lost the same. CABLE HIGHLIGHTS: VH1’s BLACK INK CREW led Wednesday cable, up 0.08 to 0.52. ESPN’s NBA doubleheader on the final day of the regular season was at 0.46/0.41. 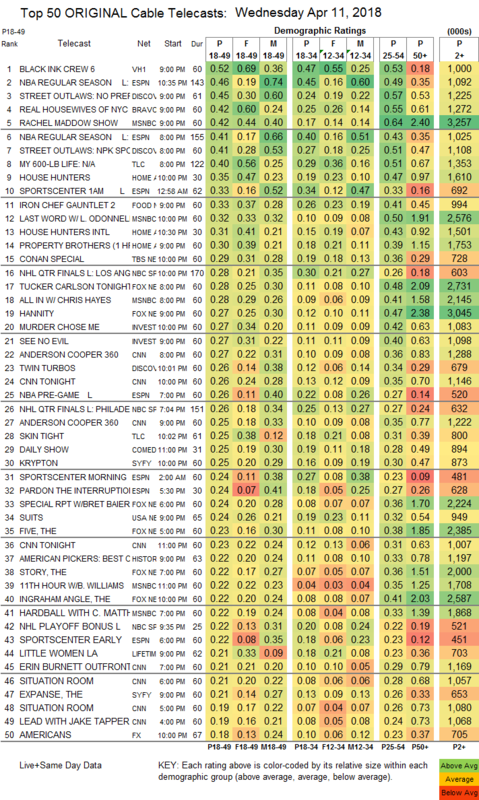 On Discovery, STREET OUTLAWS was at 0.45/0.41 compared to last week’s 0.45/0.41, and TWIN TURBOS was down 0.02 to 0.26. Bravo’s REAL HOUSEWIVES OF NYC dipped 0.04 to 0.42, and the lead-out series premiere of SELL IT LIKE SERHANT was at 0.12. MSNBC’s RACHEL MADDOW was downright dominant in the demo at 0.42/0.64/3.3M, above Fox News’s TUCKER CARLSON TONIGHT at 0.28/0.48/2.7M and CNN’s ANDERSON COOPER 360 at 0.27/0.36/1.3M. On TLC, MY 600-LB LIFE lost 0.04 to 0.40, and SKIN TIGHT ticked down to 0.25. On HGTV, HOUSE HUNTERS gained 0.04 to 0.35, HOUSE HUNTERS INTL edged up 0.02 to 0.31, and PROPERTY BROTHERS was at 0.30. Food Network’s IRON CHEF GAUNTLET ticked down to 0.33. TBS’s primetime CONAN WITHOUT BORDERS special was at 0.29. NBC Sports Net’s NHL PLAYOFFS game was at 0.28. On ID, MURDER CHOSE ME and SEE NO EVIL both dropped 0.05 to 0.27. On Syfy, KRYPTON lost 0.04 to 0.25, preceded by the season premiere of THE EXPANSE at 0.21 (down 0.04 from the 2017 premiere, and up 0.03 from the finale). USA’s SUITS slipped 0.02 to 0.24. On Lifetime, LITTLE WOMEN LA shed 0.03 to 0.21, and GLAM MASTERS held at 0.12. FX’s THE AMERICANS rose 0.03 to 0.18. 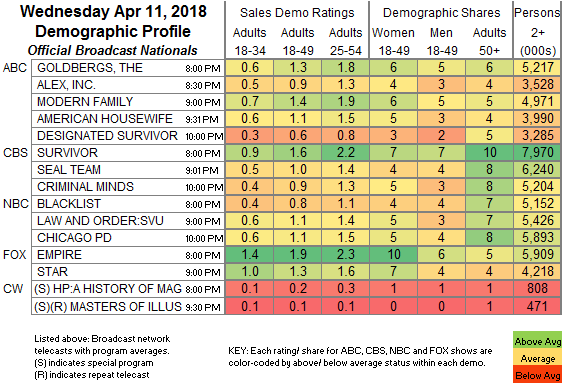 E!’s HOLLYWOOD MEDIUM was steady at 0.18. Freeform’s FAMOUS IN LOVE was at 0.12, compared to last week’s 0.12/0.09. On POP, SCHITT’S CREEK gained 0.02 to 0.08, and the season premiere of HOLLYWOOD DARLINGS was off-chart at 0.04/93K. The season finale of Sundance’s HAP & LEONARD ticked up to 0.04/174K.